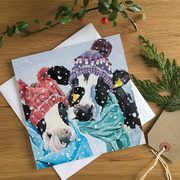 The very first of the Christmas card range, these lovely ladies are enjoying a winter wonderland in style! A fun and colourful card thats perfect for farmers. Available as a single card with kraft envelope or a pack of four with white envelope.